Frances Steel offers insight into the world of the women who worked on American luxury passenger liners crossing the Pacific from the 1950s. In the maritime world, service work was long dominated by men. Women were first employed in small numbers as stewardesses on nineteenth-century migrant ships to assist female passengers and keep a check on the morals of their counterparts in steerage. Men performed the more general service tasks – cooking and serving meals, and attending to passengers’ other needs. Shipping companies differed in their choices of which men to employ. These differences could be racial, or based on frequented routes and destinations. For instance, Chinese stewards were often employed on routes touching at Asian ports. From the first decades of the twentieth century, women started to fill new (and feminised) shipboard positions, such as nurses, laundresses and social hostesses. Eventually they would also assume jobs formerly reserved for men. In the Pacific this only occurred in the late 1950s, when the Matson Line of San Francisco employed 30 waitresses on the two new transpacific liners it launched to resume passenger services to Australia after the Second World War. The waitresses, appointed through the Marine Cooks and Stewards Union and formally rated as merchant mariners, replaced male dining room stewards. The company looked to women ostensibly in response to the shortage of first-class stewards on the U.S. west coast. Even so, men continued to be hired for service in the stateroom and public room, and held all the senior positions, including head waiter. ‘Unidentified passengers in the dining room of the cruise ship SS Mariposa II, which visited Wellington on its maiden voyage from San Francisco to Sydney’. Photographic negatives and prints of the Evening Post newspaper. Ref: EP/1956/2679-F. Alexander Turnbull Library, Wellington, New Zealand. Matson were not, however, the pioneers. This distinction belongs to the Grace Line, which began employing waitresses from the 1930s on their services between the U.S. east coast and South American ports. In 1931, the Japanese company Nippon Yusen Kaisha also trialled employing waitresses on U.S. routes. Reportedly, these women were paid the same wages as the men they replaced. There was besides the shore precedent of railroad waitresses (known as Harvey girls) who worked in dining rooms along remote rail stops throughout the American West. A culture of personalised service was also apparent in flight, itself modelled on ships and railroads. Airlines began employing women from the 1930s, in preference to the ‘cabin boys’ or male stewards who had been favoured in the preceding decade. As Kathleen Barry has shown, this helped normalise air travel and allay the safety concerns of prospective passengers. Almost three decades later, comfort – if not safety – may have played a part in Matson’s strategy. 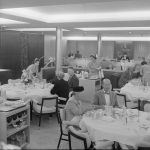 On these new transpacific ocean liners, the figure of the waitress contributed to the restored appeal of sea travel, shorn now of its wartime privations and dangers. As the public’s fear of flight receded in the postwar era, the larger U.S. airlines, especially, began to advertise their global reach. Thus in 1955, Pan American World Airways recruited ‘Nisei’, or second-generation Japanese-American women, as stewardesses. As Christine Yano has argued, these ‘Nisei’ acted as ‘informal diplomats’, performing ‘the global politics of postwar America’. Matson’s new luxury liners complemented this positioning in its narrative about America’s postwar ‘rediscovery’ of the Pacific, representing it as a space inviting white bourgeois relaxation, and consumer comfort and freedom. The company did not recruit Pacific Islanders as waitresses; instead, its waitresses hailed from Scandinavia, Southern and Eastern Europe, and Australia, as well as the United States. Yet the feminisation of shipboard service was integral to this broader packaging of ideas about modern America and its claims to the Pacific. 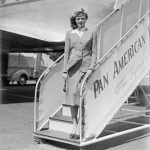 ‘Miss Anne Bisgood (air hostess), Pan American World Airways’. Ref: WA-12082-G. Alexander Turnbull Library, Wellington, New Zealand. The air hostess was practically synonymous with flight. Ocean-going waitresses, on the other hand, were inconspicuous in advertisements for sea travel, which focused instead on passenger comforts, shipboard innovations or island scenery. Assigned to separate living quarters and enclosed recreation and deck spaces, they were also expected to be relatively unobtrusive on board. Not permitted to mingle with passengers, waitresses were described as ‘ship phantoms’, who disappeared to a ‘no man’s land’ after each dining service. Passengers, it was lamented, ‘get nowhere trying to date them’. Since Matson believed younger women resented these restrictions, it employed older waitresses, who were mostly in their 30s or 40s; the eldest was 53. This was in stark contrast to the airlines, which forced their female crew to retire by age 32 or 35 – an age ceiling that did not apply to male flight attendants. Matson’s recruitment of waitresses ran into union opposition. A section of the Stewards Union invoked a traditional nautical conflation of women and danger at sea; it expressed alarm at the imagined spectacle of waitresses breaking into panic when their ship ran into trouble, or of ‘physically incapable women’ attempting to row lifeboats clear of a foundering ship. Such scaremongering had been commonplace for several decades with respect to Asian maritime crews. Though women only made up a small proportion of the crew, these fears could become magnified on an ocean like the Pacific where ships often went days without sighting another vessel. For their part, chief stewards enthused that waitresses were neater in their work and took greater interest in little things, such as tending flower arrangements. Passengers, too, liked the presence of waitresses. The only complaints following the maiden 42-day round trip between San Francisco and Sydney in 1956 concerned, perhaps predictably enough in retrospect, the women’s uniforms, which were decried for their ‘tea room’ look. The opportunity to travel was a big part of the job’s appeal, but there were also other enticements. One waitress described the job as addictive because it relieved them of domestic duties such as housework and cooking, now done for them by other (male) crew. Again, in contrast to the air, where hostesses were ostensibly trained homemakers in waiting, this aspect of gendered domesticity of female employment on ships appears to have been more ambiguous. The figure of the ocean-going waitress embodied interlaced themes of postwar modernity and mobility, labour and consumption. This change in the working world at sea also gendered the U.S. presence in the Pacific in more layered ways, serving as a counterpoint both to the masculine deployments of the Pacific War and the sexualised fictions of Hollywood’s South Seas. Frances Steel teaches Pacific History at the University of Wollongong. 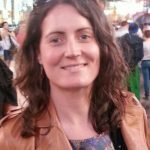 She is currently writing a book on the histories of the British and US empires in the Pacific framed by transpacific routes of passenger shipping and aviation (ca.1860–1960). Her interest in waitresses at sea arose out of this broader project. Her major publications include Oceania under Steam: Sea Transport and the Cultures of Colonialism, c.1870-1914 (Manchester University Press, 2011), the multi-authored Colonialism and Male Domestic Service across the Asia Pacific (Bloomsbury Academic, 2019) and the edited collection New Zealand and the Sea: Historical Perspectives (Bridget Williams Books, 2018). Follow Frances on Twitter @FrancesMSteel.